You are here: Home » Media » Citizen Journalism » #Occupy movement sweeping the nation, now including Omaha! 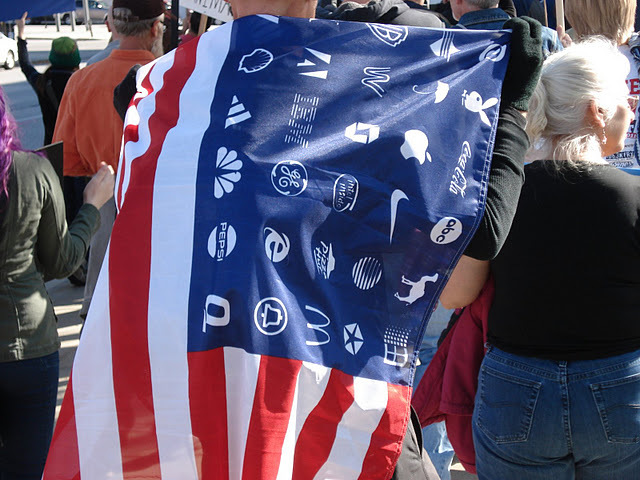 I was at our local #occupy protests on Saturday for what organizers were calling a “Global day of action”.? This week marks one month since #occupywallstreet began their occupation in New York City, and have proven to be an inspiration to people around the globe. Omaha is not exactly known as a hotbed of radical activism or sentiment.? Protests here regularly turn out a half-dozen or so committed activists, but rarely much more than that.? 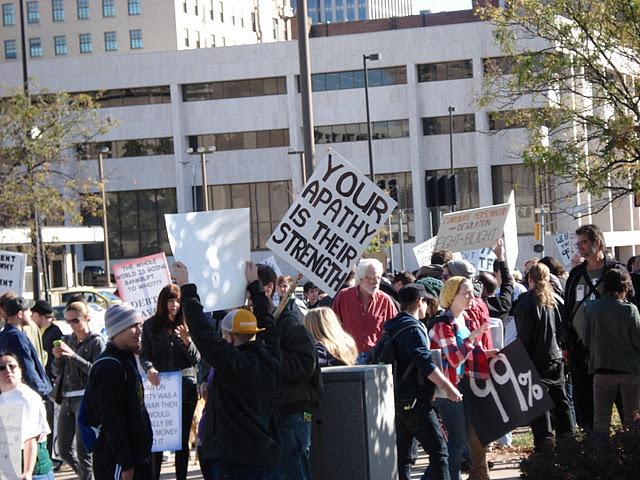 My wife and I decided that the time had come for us to express our discontent with the existing socio-political environment here, and so we headed out to #OccupyOmaha on Saturday morning.? Expecting low numbers, we were surprised when we could see people streaming towards the meeting site from blocks away. Omaha police estimated the crowd at 900-1,000.? Protestors respectfully followed the laws and police directions, avoiding even jaywalking during the three-hour long protest and march.? Police officers on horseback were kind enough to stop traffic as the march wound its way through downtown, picking up additional protestors as the march passed by the farmer’s market.? Hundreds of cars, trucks and buses driving by honked in solidarity, flashing thumbs up and waving to the protestors as they drove by. Like others have noted, this was not a protest primarily of dirty hippies, or socialists, or any other epithet conjured to dismiss this movement.? These were people from across the political and socioeconomic spectrum.? Old and young, white and black, right and left, Omahans were there to express the most fundamental of rights guaranteed by our Constitution– freedom of assembly, and petitioning our “leaders” for redress of our grievances. I must say, I have been extremely discouraged over the past few years.? I thought I was one of a relatively few people who knew or cared about the state of our great nation, which has been hijacked in what economist Simon Johnson calls “the Quiet Coup“.? A relatively small number of moneyed interest have corrupted our government, turning it to their own ends. This Occupy movement though, has rekindled in me a sense of pride and patriotism.? Hundreds of thousands of people are taking to the streets worldwide in protest of government corruption, undue corporate influence, and the failure of government in its most basic responsibilities: taking care of those who cannot help themselves and ensuring the foundations for future prosperity through investments in infrastructure and education.? We may not have all the answers, but we are at least asking the questions as a democracy.? This is democracy-in-action, with an active and engaged citizenry.? Those who are calling for protestors to name their specific demands are missing the point.? Democracy is the point.? Shedding years of apathy is the point.? Rediscovering our communities is the point.? Demanding accountability from our elected officials is the point.The time has come to realize our collective responsibility to ensure democratic values are lived, and not just a propaganda prop which is rolled out every four years. They (the 1%) broke the system.? It’s not up to us to tell them how to fix it, but we are staying here until they do.? If they can’t fix it, then we will stay here until we find someone who can.? We are that someone.? I am one of the 99%, and you are too.? Join us. is a full-time wage slave and part-time philosopher, writing and living just outside Omaha with his lovely wife and two feline roommates. Congratulations to Omaha! That is an impressive turnout. And imagine if each of those protesters contacted 20 other people in Omaha, that could be almost 20,000 people. That would be 1/20 of Omaha. That’s how fast the fire of protest can spread. And if each of these people would actively speak up when an ignorant person characterizes the protesters as “dirty hippies, or socialists, or any other epithet” that is marketing and education that is far more potent than the frantic spin of camera-hogging divisive politicians. The Occupy movement seeks democracy. It dares to believe the sorts of things that we teach our children in civics books in grade school. The first was “acknowledge our existence.” The second was “make a nominal investment to covering what is happening in our lives.” Historically, this has been a tall order — if there’s one thing the media has excelled at in the past few years, it’s been ignoring the multiple crises in which the larger population of ordinary Americans find themselves embroiled, specifically income inequality and unemployment. But there’s evidence that the Occupy Wall Street movement is actually starting to change this, and that the media is starting to pay attention.